One of the hottest cities in the US is Phoenix, Arizona. It holds the highest average temperature during summer among major cities with temperatures exceeding 100 degrees. Because of the hot Arizona Phoenix weather, keeping cool is a primary consideration in house construction and repairs. Most structures use air-conditioning to keep the temperature cool inside. However, this is not the primary factor planners have in mind when constructing houses. Their priority is the roof, particularly using the correct materials and design to combat heat. The cooling effects brought by terra cotta roofs are found not only on the materials used but also on the design itself. The curved or “S”-shaped roofing materials are placed in interlocking fashion to form beautiful arches. The spaces between the tiles allow air to freely flow and circulate, thereby rapidly dissipating heat and keeping the structure cool inside. A product of modern technology, rubber roofing is made from thermoplastic or ethylene propylene diene Monomer (EPDM), a synthetic rubber. The reflective properties of the rubber minimize heat absorption from the sun and keep the structure cool. Roofers get extra benefits from using rubber-membrane roofing – waterproofing the roof because of their seamless nature, which further prolongs the roof lifespan by preventing water from seeping in. An affordable alternative to other roofing materials that many builders in hot countries prefer because it takes a long time to heat up from being exposed to the sun. Concretes are either poured to form slab roofs or installed as tiles. An added advantage from using concrete roofing materials is their fire-proof qualities. Roofers can enhance the cooling capabilities of concrete roofs by using light colors that reflect sunlight. A very common roofing materials that originated during the 17th century. Slates come from natural stones and are available in light and earth-toned colors. The material’s reflective properties reduce heat absorption from the sun and keep the building interior cooler. Its global use can be attributed to its reputation as a cool material for roofing and availability in places where slates are abundant. 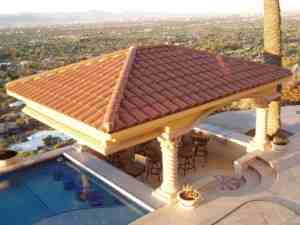 Phoenix, Arizona with its arid weather and long sunny days is perfect for this type of roofing system. Solar panels or photovoltaic roof shingles do not actually reflect sunlight but absorb them and convert the heat into electricity.